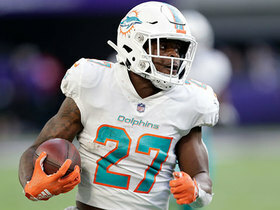 Smith caught 10 of 11 targets for 73 yards and three touchdowns while playing all 16 games in 2018. Analysis: Smith entered the season with only four career touchdowns but had three straight games with a score late in 2018. The veteran tight end has yet to reach 100 receiving yards in a single season as he enters the second year of his contract in Oakland. Smith wasn't targeted in the passing game Monday in the Raiders' 27-14 win over the Broncos. 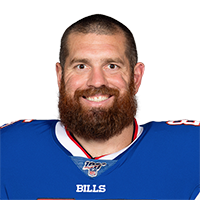 Smith (back) won't carry an injury designation into Sunday's game versus the Bengals, Paul Gutierrez of ESPN.com reports. Analysis: Smith was a limited participant in the final two practices this week, but the issues won't affect his game status. The eighth-year pro works mainly in a run-blocking role while Jared Cook handles pass-catching duties. Smith was limited during Thursday's practice due to a back injury. 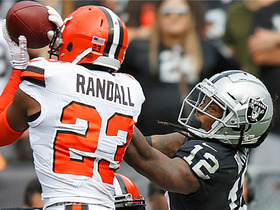 Analysis: Smith was a new addition to the Raiders' injury report Thursday after practicing in full Wednesday, though his back issue doesn't appear to be too severe. If he's unable to go Sunday against the Bengals, however, Derek Carrier could see additional reps behind starting tight end Jared Cook. Smith caught his lone target for a three-yard touchdown in Sunday's 24-21 win over the Steelers. 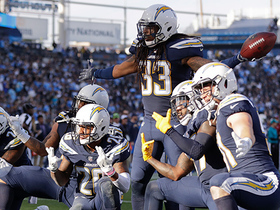 Analysis: Smith's second score in as many weeks put the Raiders ahead of the Steelers with just over five minutes to play during Sunday's tilt. Fellow tight end Jared Cook exploded for over 100 yards receiving again, but both Smith and Derek Carrier were able to vulture touchdown receptions. 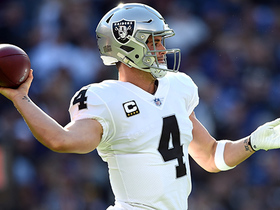 Smith's streak of finding the end zone may very well come to an end in Week 15 against the Bengals, but he should continue to provide the Raiders with real-life value as a blocker. Smith caught a one-yard touchdown pass on his lone target during Sunday's 40-33 loss to the Chiefs. Analysis: The Chiefs left Smith wide open in the end zone after the Raiders lined up in goal-line formation on the one-yard line during their fourth-quarter comeback attempt. Smith, who is primarily used as a blocking tight end behind starter Jared Cook, secured his first score since 2015. He's now caught at least one pass in three straight games, but he shouldn't foster attention from a fantasy perspective while Cook is healthy. Smith caught two passes on as many targets for 39 yards in Sunday's 34-17 loss to the Ravens. 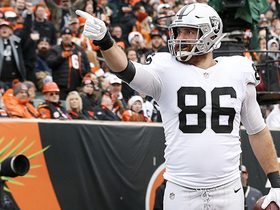 Analysis: Smith is primarily used as a blocker, but the backup tight end has caught a pair of passes in each of the Raiders' past two contests after a five-game drought. His role should remain limited in Week 13 against the Chiefs with starter Jared Cook at full strength. 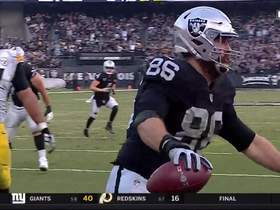 Oakland Raiders quarterback Derek Carr converts fourth-and-1 to Lee Smith for 30-yard gain. 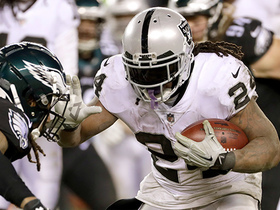 Four Philadelphia Eagles defenders cannot bring down Oakland Raiders running back Marshawn Lynch. 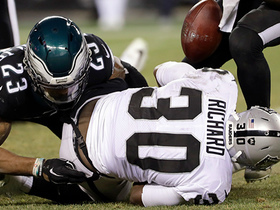 Philadelphia Eagles safety Malcolm Jenkins rips the ball away from Oakland Raiders running back Jalen Richard forcing a turnover. 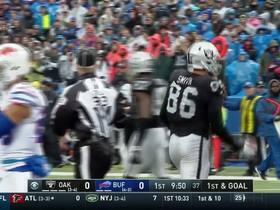 Oakland Raiders tight end Lee Smith out-muscles Buffalo Bills safety Trae Elston and lands at the 1-yard line to set the Raiders up for a score. 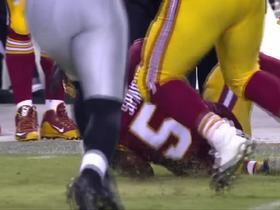 Oakland Raiders wide receiver Seth Roberts fumbles and Washington Redskins linebacker Martrell Spaight recovers fumble.